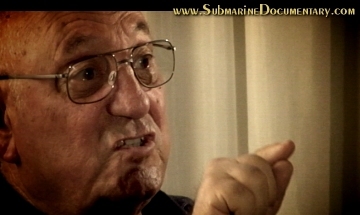 "This is the BEST submarine documentary I have ever seen. It should be in every library in America." 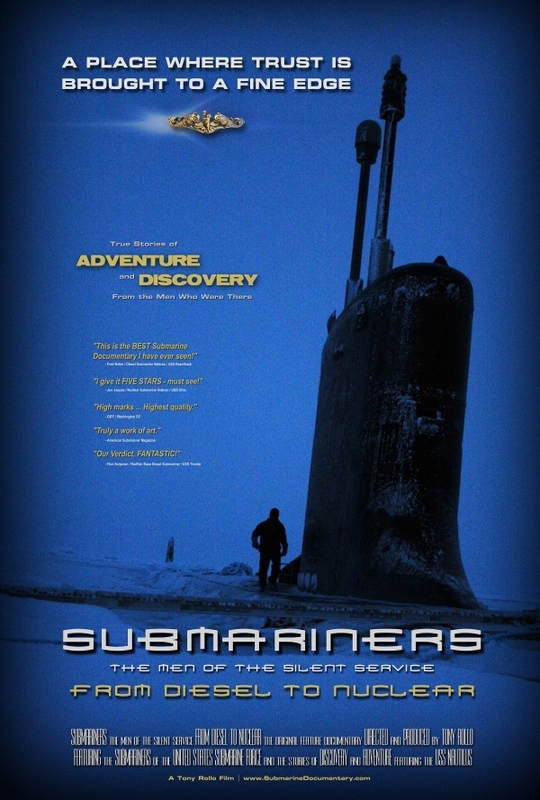 A dramatic exploration of the Cold War transition from World War diesel submarines to the technological wonders of nuclear submarines in the 20th century as vividly revealed by fifteen American Submariners who personally participated in key events of history. "As a former teacher, think it would be an excellent tool to use in the classroom." 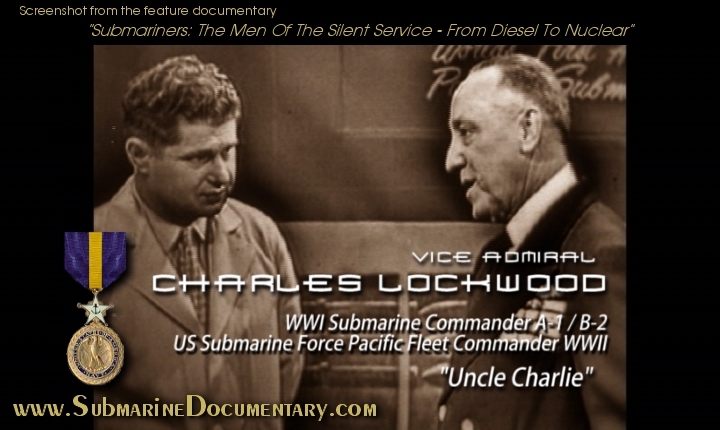 This feature documentary, while also satisfying the fascinating allure in the technology of American submarines, explores those who posessed the unique abilities and personality necessary to endure the demands and missions of the Silent Service. "Truly, a work of art." Dramatic stories of triumph and unknown details from the first two, near deadly attempts and then the successful historic 1958 crossing of the North Pole by the USS Nautilus from five original crew members who were there including the original navigator and other key personel in exclusive interviews of intriguing first hand accounts. Surprising details of the mysterious sinking of the USS Scorpion in 1968 and the dangerous training every submariner endured in order to escape from a sunken submarine and overcome the two main horrors that all submariners fear the most. "I give it five stars -- must see!" 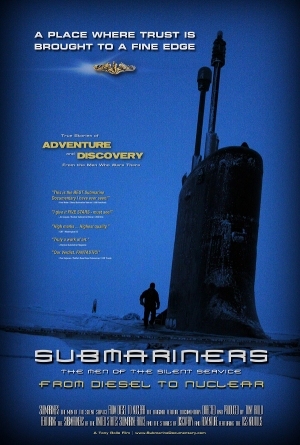 Experience an actual 1980s Cold War mission taken from real historic footage as the crew of an American nuclear submarine encounters a Soviet submarine in the frigid depths of the North Atlantic Ocean. A definitive exploration of the common thread that American submarine sailors share from fifteen American Submariners who served on historic submarines such as the USS Nautilus, USS Sea Fox, USS Ohio, USS Tirante, USS Razorback and more. "The movie's impressive. It has something for everyone..."
"This is one of those must see to appreciate films that we hear about all the time from Hollywood." "Every once in a while, we watch a film or movie and say, 'WOW' ! This was my response to the new feature submarine documentary called "Submariners: The Men of the Silent Service - From Diesel To Nuclear" by Nashville filmmaker Tony Rollo." "This is an important film at a time where the need for future submarines is now being debated in the halls of Congress." "This is not a rehash of any previously released material - it is new, fresh and fun. I loved it!" "Based in Nashville, Tony started reaching out to submarine veterans in 2010 after learning a cousin had made the polar run on the Nautilus in 1958. 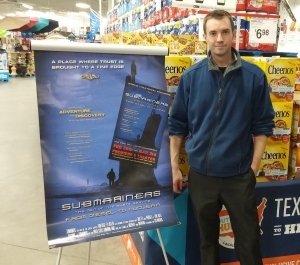 Following a visit to a base meeting of the volunteer base in Murfreesboro, Tennessee, Tony was hooked on the idea of sharing in submarine history and veteran's stories to the viewing public -- a movie made for both the public and those already enthused about submarines." 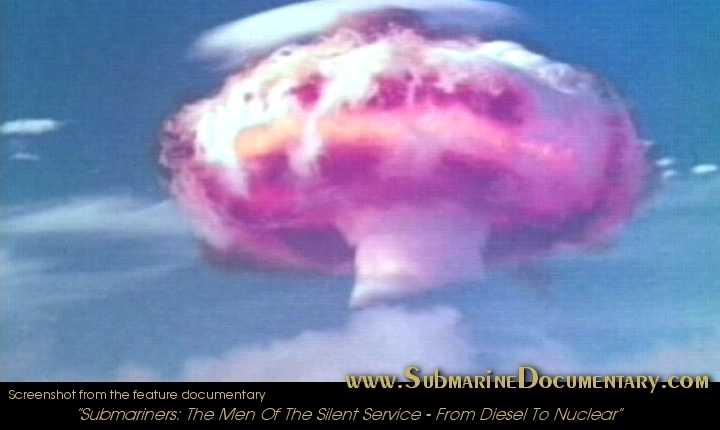 Screenshot from the feature submarine documentary "Submariners: The Men Of The Silent Service - From Diesel To Nuclear" of an actual nuclear submarine on a mission during the Cold War era as it prepares to dive.
" As a collector of submarine artifacts, photos, and films, I thought I had seen most of the available vintage submarine film footage. The new material found in this documentary is nothing short of unbelievable." unseen footage in this film. "There were several points where I laughed out loud !" "This film has something for everybody, especially if you love good sea stories and a great cast of characters. 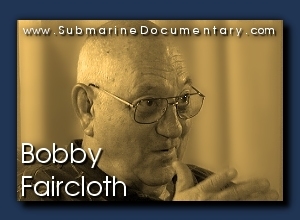 Tony does an awesome job telling the history of the submarine force from inception to today's modern boats. When the film is done, you will smell the diesel fumes in your living room! This is not a rehash of any previously released material -- it is new, fresh and fun. I loved it! 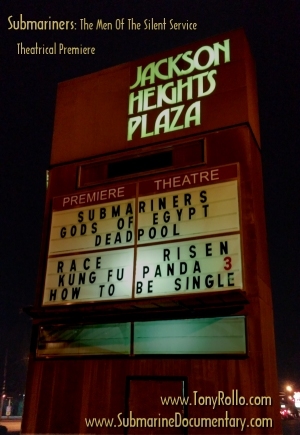 I give it five stars -- must see!" 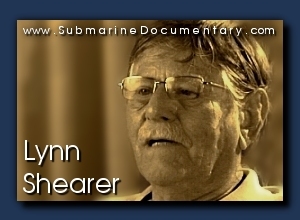 "After watching "Submariners: The Men of the Silent Service", one would get a pretty good idea what part submarines and submariners played in our history. Talking to Producer and Director Tony Rollo of Nashville about the reason for producing the film, it was inspired by a childhood experience. He had a cousin who served on the USS Nautilus on its under the North Pole transit in 1958. From that time forward he was hooked on submarines. He produced the film in order to educate the general public. 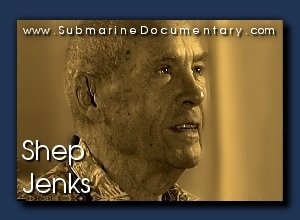 His film has made submariners reflect on their service and their experiences. This is one of those must see to appreciate films that we hear about all the time from Hollywood. It brought back memories of being back on the boats. Truly, a work of art." 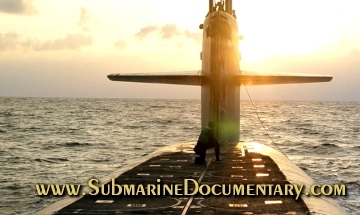 While this Submarine Documentary was made primarily for the general public who are fascinated by submarine life as a look into the secret world of the Submarine Sailor, the Submarine Veterans are embracing the movie across the nation. 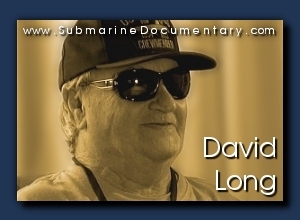 The producer and director, Tony Rollo of Nashville is greatful to the Submarine Community for their participation and are pleased to see the movie accepted by the submariners and Submarine Service Veterans. "We've been awaiting a non-fiction, un-glamorized movie about what it's really like for the iron men who live and work aboard sharks of steel. 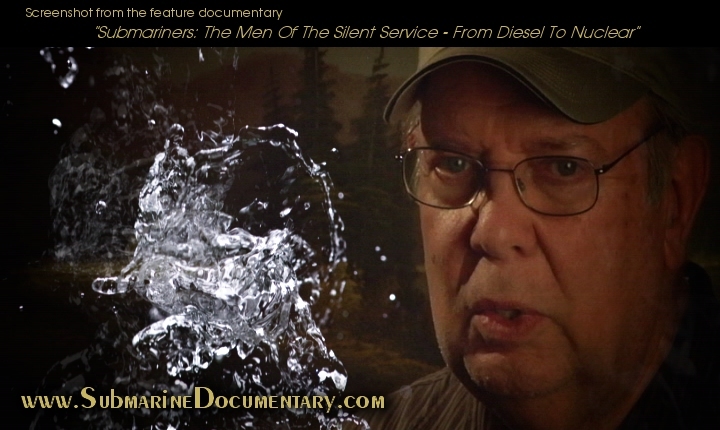 Just released is the feature documentary, "Submariners: The Men of the Silent Service - From Diesel To Nuclear," featuring on-camera interviews with 15 submariners who served on board diesel-electric and nuclear boats. Before the movie's final production, Tony Rollo, producer / director, invited USSVI's Volunteer Base (Tennessee) to a private screening. It's more than about subs as weaponry. It's about the lives of submariners. in every school in the country. 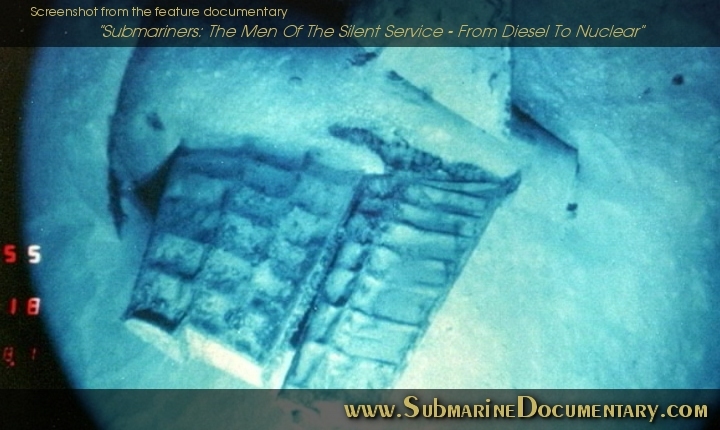 "...Rollo says the documentary's main focus is on what the men of The Silent Service have to say, that the unscripted submariners give the film its story lines. "Sure there's history, technology and hardware, but it's the submariners who provide the action, surprises, excitement, salty language, and hilarious personalities and situations." "Among stories is one told by a USS Scorpion crew member who's transferred to USS Nautilus before Scorpion and all hands were lost in 1968. 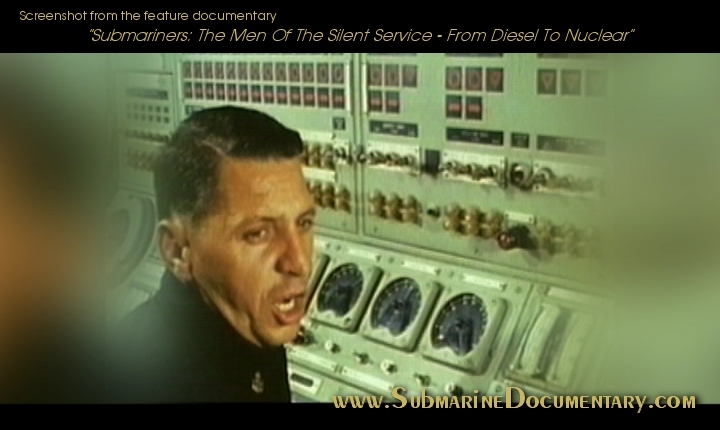 "Submariners: The Men Of The Silent Service - From Diesel To Nuclear" also features lots of humor. Tony Rollo of Nashville [ the Producer / Director ], is a professional film and media producer, Honor Society Actor, director and writer, and a member of the American Historical Association and the Tennessee Historical Society." 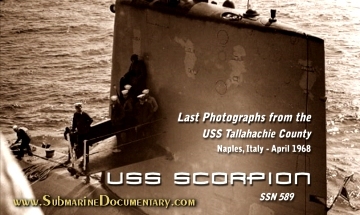 The image above are the deep water remains of the USS Scorpion as seen in this submarine documentary. The mysterious and tragic loss in 1968 of the USS Scorpion SSN-589 is explored. Rare images of the last time the Scorpion was seen are featured. A crew member of the USS Scorpion who was transfered to the USS NAUTILUS just weeks before the loss of the USS Scorpion tells his story and reveals the heart of the Submariners. 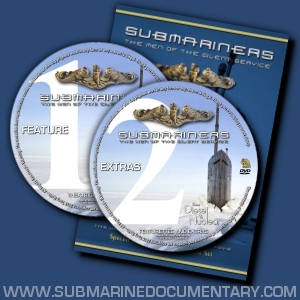 Fifteen American Submariners share stories and fascinating details who served on historic missions and submarines such as the USS Nautilus, USS Sea Fox, USS Ohio, USS Tirante, USS Razorback and more in dramatic interviews. 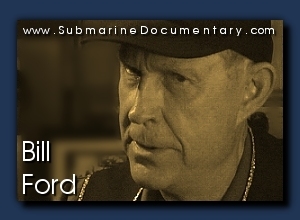 Bill Ford served as a Diesel Submariner on the USS Tirante SS-420 and deployed to the North Atlantic in covert Cold War missions. He was trained on board the Tirante by and served along side with crew members who served on the Tirante during World War Two. 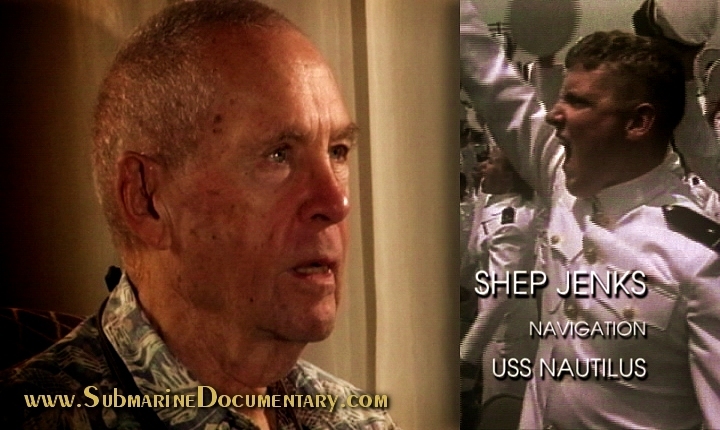 Shep Jenks was the navigator during the historic North Pole journey of the USS Nautilus SSN-571. See actual historic footage of Shep Jenks aboard the Nautilus and on a top secret mission in the nose of a bomber as he observed the polar ice flow before the third attempt to cross under the ice of the North Pole. 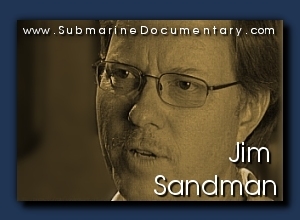 Jim Sandman served exclusively on Fast Attack Nuclear Submarines in Fire Control of weapon systems and targeting. 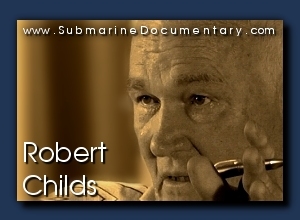 A long career aboard many Nuclear Submarines during the Cold War and on to Desert Storm. David Long was among the first of the Diesel Submariners who was chosen to become one of the pioneering Nuclear Submariners. Long made his first pacific deployment on the USS Menhaden SS-377. Upon returning to San Diego, he requested to go back into the Pacific on an extended WestPac deployment with the USS Sea Fox SS-402 which made it�s first stop at the island of Tahiti to his wild-eyed wonder experiencing Tahitian natives in grass skirts. He moved to the USS Nautilus and was part of the crew on the historic journey across the North Pole. 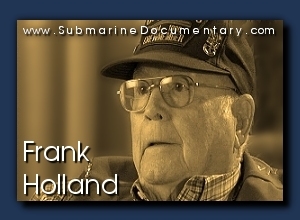 Frank Holland's long career in the US Submarine Service began in the 1940s. After serving on many Diesel Submarines, he was then part of the crew of the USS Nautilus during all three attempts to pass under the ice of the North Pole. Hear and see his dramatic and gripping details of the first attempt to conquer the North Pole from the Atlantic side where the USS Nautilus became damaged and lost for three days. Jon Jaques served on the USS Ohio SSGN-726 during the Cold War when the USS Ohio carried nuclear missiles as a fleet ballistic missile submarine, known as SSBN or �boomer� submarine. 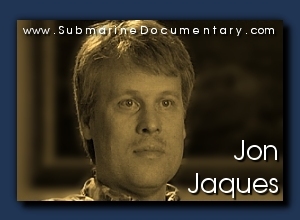 Jaques is a submarine memorabilia collector and submarine historian who is actively involved with US Submarine Veteran events. First assigned to the USS Scorpion SSN-589 and then fate stepped in as he was transferred to the USS Nautilus just before the USS Scorpion made it�s final voyage and lost with all hands. 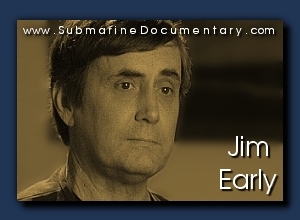 Jim Early served as a Nuclear Submariner during the Cold War as the Sonar �ears� of SSBN �boomer� fleet ballistic missile submarines. 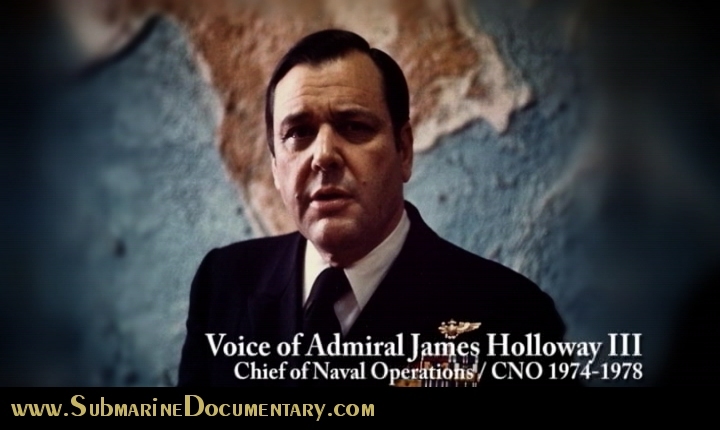 His interest in the Navy and submarines started in his youth seeing submarine movies and popular television shows such as �Voyage To The Bottom Of The Sea� and was determined to join the US Submarine Force. Provocative and humorous in his accounts, he led a very interesting life in the US Navy as he worked to become a Submariner. His journey through service culminated with service aboard the USS Nautilus. 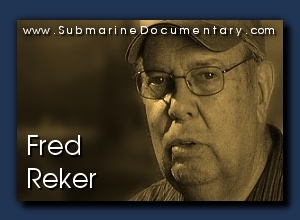 This Georgia native farm raised Submariner first served on Diesel Submarines including the USS Amberjack SS-522 in the early 1950s. Because of his skill and experience, he was chosen for Nuclear School and then assignment on the USS Nautilus to be part of the historic North Pole journey. 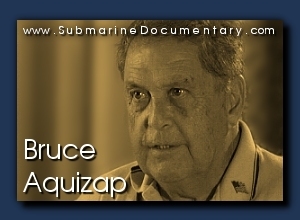 Starting out as a Diesel Submariner, Bruce Aquizap made the transition to Nuclear Submarines to join the crew of the USS Nautilus during its historic North Pole mission. 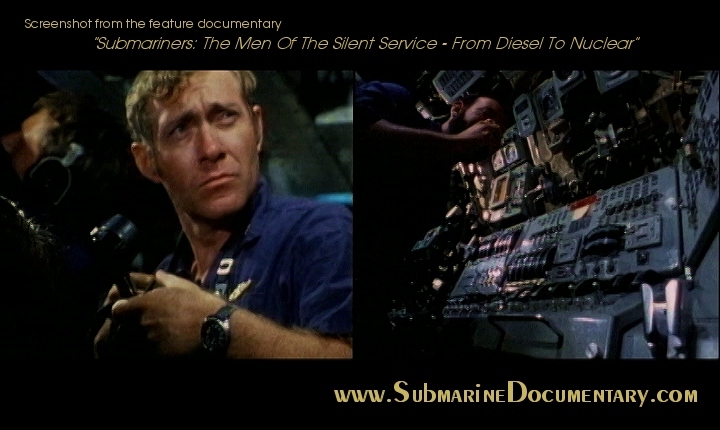 It is his way of describing Diesel Submarine service that brings drama as well as great humor to this feature submarine documentary. 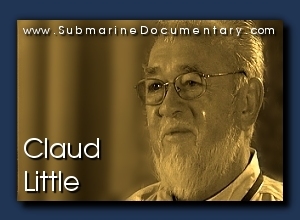 Growing up in a town that was all about building submarines, he fell in love with submarines at an early age. A Diesel Submariner on the USS Razorback SS-394 during the early 1960s and the Cuban Missile Crisis. As a new Submariner, he discovered the rigors of making his qualifications during a WestPac deployment. With a deep knowledge of Diesel Submarines, he provides much more than a mere glimpse into the heart and mind of the Submariner. 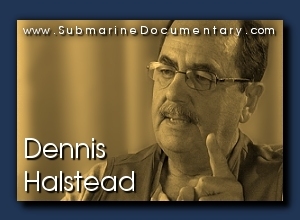 Dennis Halstead served as a Nuclear Submariner with tremendous insight into the honor of the Submariner. He was serving on the USS Nautilus and on duty when the collision with the USS Essex occurred. 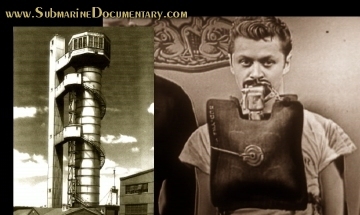 His insights to passing the escape tower tests brings the seriousness of the Submarine Service to light. 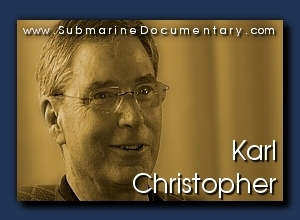 As the son of a 32 year career American Diesel Submariner, Karl Christopher achieved submarine school and served aboard Nuclear Submarines during the 1960s including the opportunity to be a member of the USS Nautilus crew. After service, he became an educator who encourages students with what it means to serve our great nation and to consider joining the US Submarine Service. Robert Childs was fascinated with technology growing up in the 1950s. As a young teenager, after reading a book about the USS Nautilus he was determined that he would become a Submariner and one day be a member of the Nautilus crew. His dream came true.